Please use this form to contact us for information on Wedding receptions, Inn Reservations, or to inquire about booking a stay in the Carriage House. Check through some frequently asked questions and then send us a message and come see us and take a tour. Our Wedding Season starts the second week of May and ends the last weekend of November. Weddings held in May, June and October (off season) are held in the barn. Weddings held during July, August and September, guests have the choice of a tented wedding on the North Terrace or the barn. Tents are not included in the facility fee but may be rented from several vendors nearby. May we bring in our own caterer? We understand that certain clients have a strong preference about who caters their event and therefore allow them to select the caterer of their choice. We ask that all caterers be licensed and insured and require a certificate of insurance listing Clark’s Cove Farm & Inn as an additional insured. For the safety of all our guests and our ability to continue to host events, we have well defined policies concerning alcohol. No alcoholic beverages to be served after 10PM without prior authorization. No alcoholic beverages maybe consumed by persons at any time (e.g., set up, ceremony rehearsal, take down, after parties, etc.) on the premises other than those registered to stay in the apartments or carriage house except during the event time designated in the contract. No alcoholic beverages may be taken from the site immediately following the wedding. All alcoholic beverages will be stored in a secure location after the event. This is a safety policy. The wedding party or their representatives may pick them up the following day. Alcohol, irrespective of type, must be served by the catering staff or a licensed bartending service at all times during event. Only alcohol provided and served by the vendor may be consumed on the premises the day of the event. No exceptions. What makes you different as a Venue? 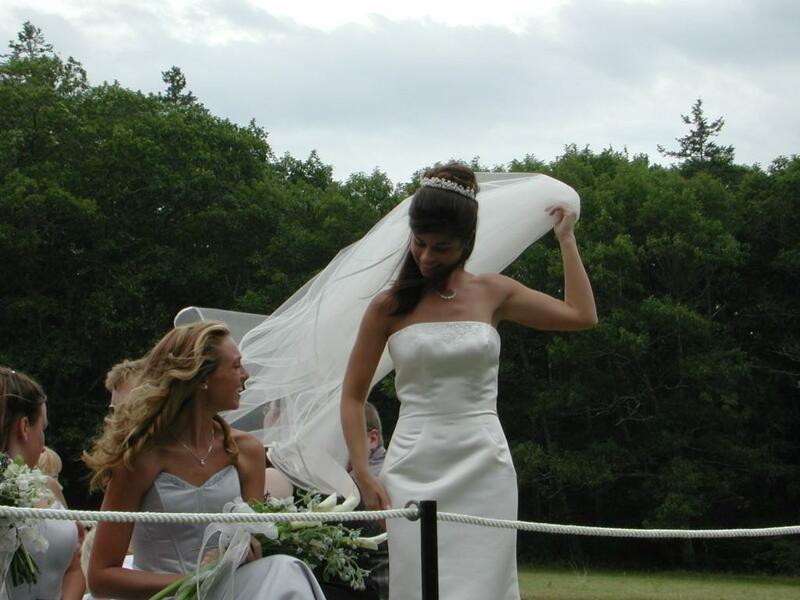 We believe that that there are two reasons why we are the “premier” event venue on the Midcoast of Maine. 1. Our Venue – A truly beautiful space with breathtaking vistas, immaculately manicured grounds, multiple settings for ceremonies and gardens that defy description. Each Wedding we receive comments such as magical, majestic, stunning, gorgeous, heaven and more. We smile and say thank you knowing that we have accomplished what we set out to do – create a sacred space. 2. Our Philosophy – is based on we do what we say and say what we do. Our mission is to make each event stress free and relaxed and totally memorable. Unlike many venues, we host only one couple per weekend and are available around the clock should you have questions or need help. We love music! Over the years we have had some extraordinary bands perform as well as DJ’s. Music and dancing can take place in either the barn or under a tent. A dancing floor ($$$) has to be rented for tented weddings. For couples trying to tighten their budget, an amplifier, a micro jack input ( laptop or iPod) and 2 large speakers are available. What is your Pet Policy ? Dogs are permitted in the apartments. There is an additional $15.00 charge per night. Dogs are not permitted in the Carriage House. Dogs must be leashed at all times. Established event venues typically have a provision for insurance. We require event insurance for the day of the event and if you plan to set up the day before we ask that you take a two day policy. We recommend WedSafe as they specialize in event insurance and are the most cost effective option. We require $1,000,000/$2,000,000 coverage and also ask that your policy cover the day prior to the wedding if you are going to be involved in the set up. Fireworks – Maine now allows Fireworks and so do we providing the season is not to dry. Ask about our policy when you speak with us. Bonfires – Several years ago we built a large bonfire site in the middle of the orchard. Catch up with old friends, kindle new relationships and invite a storyteller. This property has an ancient medicine wheel in the field below so your blaze could get quite interesting. Although we occasionally schedule an event sight unseen, we recommend that you give us a call to schedule a tour. Tours can be scheduled anytime If you think the pictures are beautiful, you are in for a nice surprise. Pictures simply cannot capture the beauty nor convey the energy at the Farm. It is truly magical! The only silly question is the unasked question. Over the years we have heard them all. One year we were asked whether we could handle a helicopter landing. We cleared a helicopter landing strip in the north orchard and the groom and several accomplices arrived. We do our best to think outside of the box and have been known to turn wish we could to smiles and thank yous. Just Ask!